What organ eliminates two pounds of waste acids daily? What is one of the most important elimination organs in the body? What organ receives one third of all the blood that is circulated in the body? 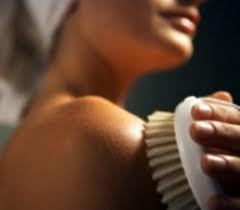 Dry skin brushing is one of the healthier self-help methods available to us today. Stimulation of the skin sets in motion natural healing pathways within your body. Additionally, it encourages nerve beds within its structure that in turn increases normal healing processes throughout the body. Your skin is the primary sign of an internally toxic body. As soon as your internal body becomes toxic, it will spread out into your skin causing your skin to become irritated and itchy. There are numerous ports of elimination of the skin including your mouth, face, and arm pits, the inside of your upper thigh region, feet, and toe nails. Did you know that body odor is also an additional indicator of toxic build-up and is eradicated through the same channels. Let’s not forget your tongue, which builds up a plaque and is yet another gauge of toxins in the body. Our skin is permeable or porous, and can absorb toxins directly from the environment. Skin brushing can help counteract that and will enhance your health significantly. It is a fact that the skin is one of the optimal ways to getting to the endocrine system and all the glands it reaches very quickly. In addition, at the same time, it triggers them to react successfully. The instantaneous result from a brushing session is a feeling of increased physical well being. 2. Purchase a brush with a long handle, so that you are able to reach all areas of your body. Best-case scenario would be one that had a removable head with a strap for your hand. 4. Skin brushing should be performed prior to your bath or shower and your body dry and naked. 5. Begin brushing your skin in long sweeping strokes starting from the bottom of your feet upwards, and from the hands towards the shoulders, and on the torso in an upward direction. Always brush towards the heart. Try and brush several times in each area, over-lapping as you go. 6. Avoid sensitive areas and anywhere the skin is broken. 7. After brushing your skin, rinse off in the shower. Alternating temperatures in the shower from hot to cold will further invigorate the skin and stimulate blood circulation and bring more blood to the outer layers of the skin. 8. After getting out of the shower, dry off vigorously and massage your skin with pure plant oil, such as almond, jojoba, sesame or coconut. 9. Don’t forget to clean your skin brush using soap and water once a week. After rinsing, dry your skin brush in an open, sunny spot to prevent mildew. 10. For a thorough lymphatic cleansing, perform skin brushing daily for a minimum of three months. Caution: Do not brush on or over skin rashes, wounds, cuts, infections, poison oak or poison ivy. Note: Any well designed program will take about 30 days to see and experience the changes. Please be patient and keep up the program!